Yet another variation on the midriff band, this one on eBay from Macajero for the unbelievably low price of $5.00. Considering I finally figured out what my first attack at the Hot Patterns Hippy Chick Dress would consist of (I woke up from a deep sleep last night with the idea — the leftover Liberty dot-swirl-star print twill matched with a deep red heavy cotton/lycra, and let's just hope I have enough of each), you'd think I'd be leaving the midriff dresses alone. Ah, but you see — this one is SURPLICE! The lure of the surplice cannot be underestimated, despite the inevitability of having to sew invisible snaps in them so that they don't come un-surpliced. I have found, to my sorrow, that I am much better off using invisible hooks and bars – usually trouser hooks and bars, at that – than I am using invisible snaps, but perhaps you are not giving to significant twisting and lunging in your dresses (what my dresses, at least, consider “significant”).And yes, you will want to bone the waistband (and some horsehair interfacing wouldn’t hurt, either). Remember that you will want to put some of the bones on at a slant, so that they’re not all up-and-down; it makes for a better shape. Ooh! Yes, that’s exactly the kind of waistband I was talking about, esp. if it’s wider than the illustration. I want to put a plain pencil skirt on it, though. 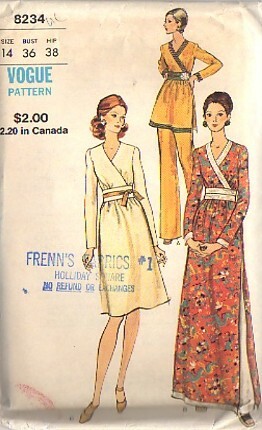 Could I bug you for a tracing of just the waistband? I know it is 3 years later, but for those of you who have just found this convo looking for a great high-waisted skirt… I recently found this one:VOGUE 8425http://www.voguepatterns.com/item/V8425.htm?search=high%20waisted%20skirt&page=7JUST WHAT i NEED.